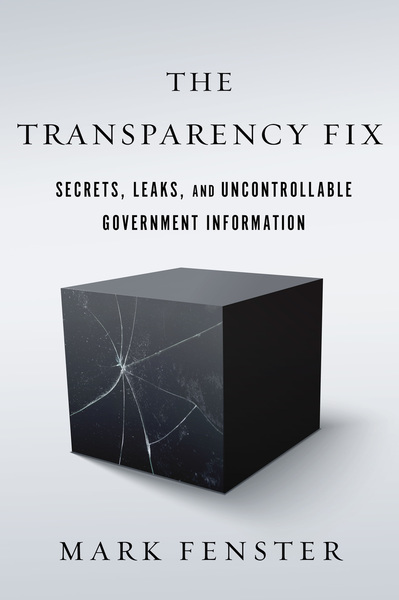 THE TRANSPARENCY FIX: SECRETS, LEAKS, AND UNCONTROLLABLE GOVERNMENT INFORMATION, by Mark Fenster. Stanford: Stanford University Press, 2017. 296pp. Cloth $85.00. ISBN: 978-1-50-360171-0. Paper $25.95. ISBN: 978-1-50-360266-3. Digital $18.65. ISBN: 978-1-50-360267-0. 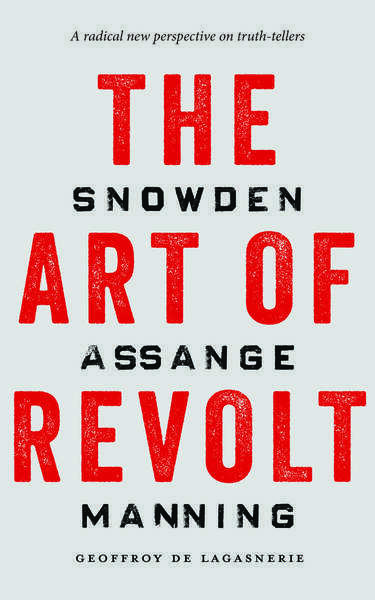 THE ART OF REVOLT: SNOWDEN, ASSANGE, MANNING, by Geoffroy De Lagasnerie. Stanford: Stanford University Press, 2017. 128pp. Cloth $60.00. ISBN-13: 978-1-50-560014-0. Paper $18.95. ISBN-13: 978-1-50-360332-5. Digital $9.99. ISBN-13: 978-1-50-360324-0. These two books each raise radical challenges to conventional thinking about the tensions between democratic theory and the modern administrative state. Both authors focus on secrecy. Democracy presupposes that the press and public must be generally well-informed about government policies and actions, yet both authors see the constant efforts of politicians and bureaucrats to restrict access to information as inconsistent with this norm. The conventional view seeks to balance governments’ acknowledged needs for secrecy against the transparency mandated by democratic theory. Fenster, however, argues that transparency is an unrealistic and theoretically incoherent ideal. In sharp contrast, De Lagasnerie argues that the state is inherently undemocratic and thus illegitimate. Fenster is a law professor, well-schooled in empirical social theory. He believes that the “transparency fix,” defined as reliance on laws that mandate access to governmental information, depends on the unrealistic idea that “a truly democratic state transparently and perfectly communicates its actions to its truly democratic, engaged citizens” (p. 5). Legal reforms, he says, have barely dented the gigantic pool of classified documents, and most transparency advocates feel obliged to recognize “a set of exceptions to disclosure that are as broad and opaque as the transparency norms themselves” (p. 10), making their vision unattainable. Yet practitioners of secrecy are equally unrealistic in thinking that they themselves can control the state’s flow of information. Fenster’s historical narrative focuses on the rise of “freedom of information” and the “right to know” as cherished principles in the WWII period, and their incorporation in law in the 1960s and 1970s. Advocates drew on Locke, Mill, Rousseau, Bentham, Kant, John Adams and Madison to argue that transparency is crucial for instilling and supporting democratic values, curbing corruption and waste, and (for some) allowing direct popular self-rule. Transparency advocates hoped that US courts would recognize this principle as encompassed within the First Amendment, but the courts declined to do so. Fenster describes and challenges the linear, cybernetic model of communication that posits a simple process of transmission of a “message” from a “source” (here, the state) to an intended “audience” (here, the public). This model, Fenster argues, mistakenly reduces excessive secrecy to a technical problem, ignoring the complex political dynamics involved. In reality, “neither transparency nor secrecy can be imposed in a manner in which the outcome is certain …. The behaviors that information disclosure is presumed to produce will not follow inevitably in its wake” (p. 79). The state is not a single, well-defined actor, but a sprawling, complex giant with fuzzy boundaries, such that neither transparency nor secrecy can be reliably imposed. Fenster argues, “Organizational control and accountability require simplicity, because complexity invites opacity and disorder” (p. 83). In other words, the flow of government information is not predictable from formal organization maps; it can be hard to know where to look for wanted information. Moreover, the constitutional separation of powers and federalism already prevent a uniform, comprehensive approach to government information, and courts are highly deferential to executive secrecy claims. In addition, statutory transparency requirements imposed on the executive are limited in scope and typically vague. For example, FOIA does not define “agency record” or impose duties to obtain and retain records. Officials thus can move documents around to avoid disclosure or, by the same token, allow them to leak. “Open meeting” laws requiring advance notice and public admission to official events are equally vague in application. In addition, many government services, including storage of information and, ironically, even processing of FOIA requests have been partially privatized; few transparency norms apply to such private entities. Fenster critically examines the commonsense understanding of “government information” itself. Fenster contends that the state produces more information than can ever be processed, some of it stored in formats that are no longer readable, and much of no public significance, so that, even if the entire archive could be disclosed, its unorganized, fragmented contents would reveal no coherent truth. Further, transparency and secrecy rules themselves influence decisions about creation and contents of records, as well as oral discussions among officials. For example, millions of documents produced each year are classified, sometimes for improper reasons. Over 713,000 FOIA requests were filed in 2015, imposing large financial and staffing costs, as well as risks to national security, personal privacy, and the candor of policy discussions. “Transparency” is an extremely simplistic way of thinking about this mass of information and how it is accessed. The vision of secrecy’s defenders is equally unrealistic. Leaks are pervasive, even though “the First Amendment offers leakers only thin protection, if it provides any protection at all” (p. 119). leaks are pervasive. Fenster shows that high-level leaks allow officials to trade information for influence and status, with relative impunity and that, despite the more substantial punishments they risk, leaks by midlevel personnel are common. Yet, since many crucial secrets are not timely leaked, leaking offers no systemic antidote for overclassification. Leaks and their typical consequences show that secrecy cannot be guaranteed, that it is less essential to its practitioners than they tend to think, and that the failures and political costs of secrecy serve as a partial check on its overuse. At the same time, ambitious leaks such as those by Daniel Ellsberg, Chelsea Manning, and Edward Snowden have failed to produce the large policy changes sought by the leakers and their supporters. For Fenster, the primary effect of megaleaks is that they threaten to make laws attempting to impose secrecy and transparency irrelevant. Fenster debunks the notion of a public ready to be informed by government information and to respond in predictable ways. First, he argues, the public is quite ignorant and misunderstands or ignores most of the available information. Cognitive limitations, partisan biases and rational choices all complicate the project of assisting citizens in voting or holding officials accountable. In effect, there is no functional [*78] market for state information, so that a general norm of transparency does no apparent good. In fact, “ignorance is socially constructed and … is an essential and pervasive component in social relations, organizations, and culture” (pp. 129-30). Second, our social and political structures make illusory the very idea of an enlightened, engaged public. Rather than a unitary public, critics say, we have multiple, inchoate publics and counterpublics, called into being and mobilized by specific messages. “[I]nstead of democratic process, we have a technological spectacle of gossip, suspicion, and the endless hunt for the latest revelation” (p. 138). Third, Fenster questions the claim that, even absent a capable public, government can be held accountable through the actions of other official or private institutions. A more transparent state does not necessarily enhance public trust. Government often fails to police its own misconduct; the media operate within market and political constraints; and NGOs collectively do not epitomize an ideal, objective, and neutral cybernetic receiver. Fenster believes laws and policies like our current ones “cannot help but fail to meet their grandest and broadest goals” (p. 149). Fenster states that government has improved how and when it releases information, and can and should continue to do so. He recommends two very modest steps: first, more reliance on independent executive agencies, such as inspectors general and the Interagency Security Classification Appeals Panel, that have both credibility and ability to supply context for their disclosures. Second, the time limits before mandatory declassification should be reduced. Yet, Fenster holds that no reforms can simultaneously “make the state sufficiently open to meet the theoretical model of a visible state while keeping it sufficiently closed to meet the theoretical model of a secure one” (p. 198). Fenster provides a useful, detailed account of the complex creation, flow and reception of government information and the impossibility of either perfect transparency or perfect secrecy. However, his critique seems far less radical than he claims it is, because his competing models of perfect, complete control are clearly strawmen, not anyone’s actual objectives. Real actors target specific information of interest to them, whether to influence current and future action or to find out or conceal what has occurred in the past. At most, reformers may more broadly target particular agencies or types of information, with their own interests and/or the general interest in mind. That they frequently fail is important, but this does little to clarify the proper role in democratic theory of access to information. Fenster claims his project is not normative, yet he pays lip-service to the norm of democratic debate, even while questioning the very existence of the public that democratic theory specifies as sovereign. He makes no effort to develop an alternative theory of democracy that does not rely on easy public access to government information. He takes no stand on specific questions like (1) whether democratic theory is compatible with secret wars or secret reasons for waging war, or (2) whether the Constitution necessarily incorporates a public right to know, without which free speech and voting rights become meaningless. Several scholars have argued (Hoffman 1981a; 1981b, 1984; Kitrosser 2015; Horton 2015; and Rudenstine 2016 ) that the answers are no and yes, respectively. Without information, Congress and the public can play no effective role in the most fateful decisions. Courts, thinking like the bureaucrats they are, have erred in recognizing implied secrecy powers without recognizing an essential First Amendment principle that could trump or at least limit those powers. Indeed, such secrecy powers lack a persuasive textual or historical basis and make it hard to specify the sense in which government is by, not just of and for the people. This last question is tackled head-on by THE ART OF REVOLT. De Lagasnerie, a professor of philosophy and sociology at the École Nationale Supérieure d'Arts de Paris-Cergy, is an influential young postmodernist. Where Fenster seems to adopt the perspective of an official trying to reconcile the state’s conflicting needs, De Lagasnerie boldly takes an outsider’s point of view, questioning both the legitimacy of the national-security state and the usefulness of [*79] mainstream politics where interest groups pursue incremental reforms through lawful channels. He celebrates the actions of Snowden, Assange and Manning for “bringing a new political art into existence” (p. 3). Their solitary actions and the “virtual collective they incarnate” (p. 7) should inspire us to rethink our understandings of the law, the nation, citizenship, democracy, and politics. Assange, in particular, rejects the idea of state secrecy itself as incompatible with democracy. The slogan of WikiLeaks is “Privacy for the weak, transparency for the powerful” (p. 18) and “The whole doctrine animating the site aims to strip members of the state of what is perhaps their most important social asset: the ability to view others as ignorant” (p. 20). Snowden, in contrast, is less opposed to the surveillance programs themselves than to the fact that they were set up without public approval and monitoring. De Lagasnerie acknowledges that a constitutional state is different from a full-fledged police state, that laws and rights do afford real protections. Yet, the actions of Snowden, Assange and Manning “call into question the frameworks of politics, the prescribed forms of activism and expression—and, in so doing, contest the mechanism of democratic politics as we know it, as it is imposed on us” (pp. 40-41). Even the most liberal constitutions allow for emergency exceptions to the rule of law, whether explicitly or not. Following Giorgio Agamben’s (2005) critical theory, focused on the exception that escapes the law within the law itself, De Lagasnerie states: “[T]he legal systems of liberal democracies … exhibit gaps at every juncture. The state order is constantly effecting operations of dispossession, discrimination, and exclusion. Moreover, “The possibility of the state of exception is at the very heart of the architecture of political power…. This is so much the case that it begins to blur the difference between liberal democracies and other political regimes” (p. 32). Another sort of gap in the law is dispossession, discussed by Judith Butler (2012). Her “critique of the nation-state … starts by focusing on the category that encompasses exiles, the stateless, and refugees…. [E]very nation-state has the innate propensity to create individuals who are expelled because they do not match the idea, the unity, and/or the definition of the nation” (pp. 33-34). For De Lagasnerie, both the exception and statelessness are instances where laws and rights are intrinsically tied to a sphere outside the law. He therefore calls not for tinkering with the legal order, but rather for “refusing to ratify the order as it stands” (p. 37). An effort to imagine a new legal apparatus that has no place for statelessness or states of exception must fall short if it fails to question “the violence to which we stand exposed inasmuch as we are citizens, members of a state, and subjects of the law” (p. 39). De Lagasnerie argues that Snowden and Manning have invoked the language of civil disobedience, but in fact they are going beyond this mechanism, “inventing new subjectivities without being aware of it” (p. 43). Civil disobedience is a public act that appeals to shared values and expresses willingness to accept punishment. In contrast, for instance, Manning acted secretly, providing files to anonymous WikiLeaks, while Snowden and Assange have chosen exile to avoid punishment. De Lagasnerie suggests these acts do not fit the traditional civil disobedience framework. Anonymity and flight are uniquely radical modalities of revolt, that aspire “to try to live the experiences of which we are deprived by the fact of being fashioned as citizens” (p. 102)..The point, he claims, is not simply the desire to escape punishment, but to affirm a new, anonymous mode of political existence. For De Lagasnerie, “The practice of anonymity enables one to act politically without constituting oneself as an identifiable subject” (p. 62). Action is carried out individually, “without reference to the constitution of a ‘we’” (p. 63). Anonymity, the author argues, opens the possibility of costless political action, eliminating the censoring effects of conventional action and avoiding the power of agents specialized in “public” democratic struggle who simultaneously bring it to life and monopolize it. Thus, it is “likely to produce extremely powerful destabilizing effects on the workings of power in contemporary societies” (p. 70). De Lagasnerie [*80] states, “Anonymous action enables the formation of conflict free from reciprocity of any kind…Anonymity means being free of the ethical scene…. Anonymous subjects endeavor to escape this contamination of politics by ethics and to enable struggles that are freed from any obsessive concern with the gaze of others….—in other words, perhaps, pure politics” (p. 74-75). De Lagasnerie may overstate the radicalism of this idea, for our Supreme Court has already recognized a right to anonymous political speech (MCINTYRE V. OHIO ELECTIONS COMMISSION, 514 U.S. 334 (1995). The second mode of resistance, flight, is for the author another mode of subjectification that defies the law and the state. “Sometimes, writings on democracy seem to want to extend the democratic sphere to everything … except that which concerns the borders between political groups and the right of individuals to get rid of them” (p. 80). In Rawls’s (1990) social contract theory, human communities are seen as prior to and outside of politics. Likewise, for Judith Butler (2012), “unwilled proximity and unchosen cohabitation are preconditions of our political existence” (pp. 82-83). For De Lagasnerie, however, democracy requires that belonging itself become a matter of choice. This is the “grandeur” displayed by Snowden and Assange. “Indeed, it may be that Snowden and Assange have called to life an ethics of the rogue to counteract the ethics of citizenship…. [W]e are witnessing, today, the birth of a new political category for individuals who are not defined by their membership in a state, or a nation, or a territory, but rather belong to a community they have chosen for themselves: democracy” (p. 89). Such individuals reject the violence of forced inclusion in a juridico-political order, where the state claims power to forbid them to leave. De Lagasnerie may err in equating Assange and Snowden here, for Snowden seems far more invested in the politics of a single country than is Assange. Now, if citizenship is a state of mind rather than a matter of law, it is not clear why physical emigration is necessary to end it. In a sense, the public of France or the United States may have already, as Fenster suggested for different reasons, ceased to exist. At any rate, De Lagasnerie argues that migration is properly viewed as exercising a political right to choose one’s nationality. As the libertarian Nozick (1999) prescribes, “each community must win and hold the voluntary adherence of its members” (p. 96). De Lagasnerie suggests that the internet facilitates the emergence of new social and political subjectivities, and this virtual space has the potential for rupturing the borders between established communities and engendering freely chosen, denationalized affinities. He concludes with the slogan, “Hello citizens of the world, we are Anonymous,” used by the hacker movement of that name. This political entity is “a provisional gathering of scattered and plural individuals who choose, at a certain moment in time and for their own reasons, to form an alliance” (p. 114), prefiguring the potential plural, heterogeneous and ephemeral communities of the future. While Fenster critiques the familiar discourse about secrecy and transparency as grounded in invalid empirical assumptions, De Lagasnerie rejects the familiar assumptions of democratic theory as normatively unsatisfactory: the liberal constitutional state is incapable of providing a sufficiently inclusive, nonviolent legal order. Thus, whereas Fenster sees the megaleakers as failing to accomplish specific policy goals, De Lagasnerie sees them as heroically, if not always self-consciously, raising profound questions about the legitimacy of the legal order. These two accounts are not mutually exclusive, but it would seem that Manning and Snowden, at least, were subjectively focused on US policy changes and continue to argue for them. Their aims may be less novel than De Lagasnerie suggests. Megaleakers do use potentially transformative technologies, yet both anonymous leaking and flight from the law are as old as the republic. Anonymous political action is often protected by law, and seeking asylum is legally distinct from renouncing citizenship. De Lagasnerie’s essay is an important invitation to begin reshaping our conceptions of law, politics and democracy in a libertarian/anarchistic direction, creatively [*81] drawing on a variety of familiar and less familiar thinkers [curiously, he does not mention Robert Cover (1986)]. The author does not pretend to have fully fleshed out a utopian vision and demonstrated that it is realistic. Concepts such as “subjectivities” are difficult to grasp: is there a set typology, la Foucault (1995), or does subjectivity take infinite, unique forms? Can we really live without stable group identities and affiliations? Despite their differences and weaknesses, these two books together reinforce the following propositions: (1) War and violence are central functions of the nation-state; (2) Inevitably, these functions are largely shrouded in secrecy; (3) Secrecy and violence are inimical to democratic self-governance; (4) The informed, engaged and potentially effective national public envisaged by traditional democratic theory does not actually exist; and (5) These problems cannot be solved by technical legal reforms. For Fenster, this is simply the way things are. For De Lagasnerie, it calls for a new vision and practice of democracy. Arendt, Hannah. 1998. THE HUMAN CONDITION. Chicago: University of Chicago Press. Butler, Judith. 2012. PARTING WAYS: JEWISHNESS AND THE CRITIQUE OF ZIONISM. New York: Columbia University Press. Cover, Robert M. 1986. “Violence and the Word.” Yale Law Journal. 95:1601-1629. Foucault Michel. 1995. DISCIPLINE AND PUNISH. New York: Vintage. Habermas, Jurgen. 1998. BETWEEN FACTS AND NORMS: CONTRIBUTIONS TO A DISCOURSE THEORY OF LAW AND DEMOCRACY. Cambridge: MIT Press. Hoffman, Daniel N. 1984. “A Republic If You Can Keep it.” MICHIGAN LAW REVIEW. 82:997-1006. Hoffman, Daniel N. 1981a. “Contempt of the United States: The Political Crime That Wasn’t.” AMERICAN JOURNAL OF LEGAL HISTORY. 25:343-360. Hoffman, Daniel N. 1981b. GOVERNMENTAL SECRECY AND THE FOUNDING FATHERS: A STUDY IN CONSTITUTIONAL CONTROLS. Westport: Greenwood Press. Horton, Scott. 2015. LORDS OF SECRECY: THE NATIONAL SECURITY ELITE AND AMERICA’S STEALTH WARFARE. New York: Nation Books. Kitrosser, Heidi. 2015. RECLAIMING ACCOUNTABILITY: TRANSPARENCY, EXECUTIVE POWER, AND THE U.S. CONSTITUTION. Chicago: University of Chicago Press. Nozick, Robert. 1999. ANARCHY, STATE, AND UTOPIA. Oxford: Blackwell Press. Rawls, John. 1990. A THEORY OF JUSTICE. Cambridge, MA. : Harvard University Press. MCINTYRE V. OHIO ELECTIONS COMMISSION, 514 U.S. 334 (1995). © Copyright 2018 by author, Daniel N. Hoffman.